Get comfortable with the consistent long-term performance of this well-contoured desktop stapler. Staples up to 20 sheets. Versatile style also pins and tacks. Solid die-cast steel foundation. 3 3/4 in throat depth. Open channel loading of a full strip of 1/4" standard staples. Manufacturer's limited lifetime warranty. All sheet capacities are based on 20-lb. bond . Stapler pins and tacks. Reverse the anvil to create temporary staples and open stapler to post papers to a vertical surface. Pros: Handles Large Volumes; Jam Resistant; Compact Design; Strong Staple power; Easy To Use I like it for the reason that it is lightweight and I always pick up my stapler to use it. It works smoothly. Very good quality for the value. Exactly what I expected Review by Carole P.
Welcome to MyBinding video. 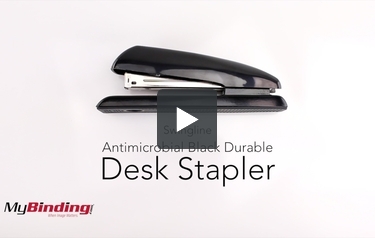 This is a Standard AntiMicrobial Durable Desk Stapler by Swingline. It’s pretty simple, but since you’re about to buy 20 of them, let’s take a look. The solid die-cast steel foundation will last you a long time and it can punch up to 20 sheets in one punch. It feels good on the hand and on the table. It has a great shape, a no-slip bottom, and resists bacteria. Staple loading is easy. Open the top, slide them in, push it down, give it a snap, and you’re all set. For more demos, reviews, and how-tos, check out MyBinding.com.